Clement Massier was born in 1845 in France. 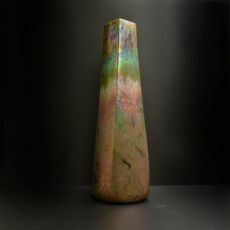 Being born into a family of ceramists, Clément Massier also took an interest in the artistic business from an early age. In 1884, after years of work, study, and travel, he relocated his share of the family firm to Golfe-Juan and began producing Hispano-Moresque-influenced pottery, with silver and copper oxide glazes made iridescence in a... Read moreClement Massier was born in 1845 in France. Being born into a family of ceramists, Clément Massier also took an interest in the artistic business from an early age. 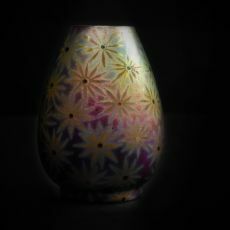 In 1884, after years of work, study, and travel, he relocated his share of the family firm to Golfe-Juan and began producing Hispano-Moresque-influenced pottery, with silver and copper oxide glazes made iridescence in a smoky kiln. Following the arrival Lucien Lévy-Dhurmer in 1887, Massier introduced fiery luster glazes enriched with etching and painting, applying them to forms ranging from hand-built individuality to slip-cast uniformity. He was soon in command of a busy factory and a showroom that boasted an elite international clientele.